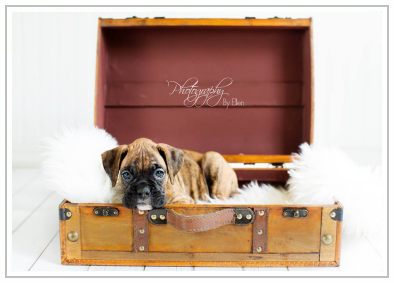 American Boxer Club: Buying A Boxer Puppy? The conscientious breeder plans a breeding to reproduce the best characteristics of an outstanding sire or dam. His guide is the official AKC Standard of the breed---the written "blueprint" that helps keep the breed uniform for generations to come. (You can find the breed standard, revised in 2005, at the American Boxer Club website: www.americanboxerclub.org). The more common disappointments for pet purchasers come from commercial sources--especially pet shops that often buy puppies from the infamous "puppy mills" that take little notice of the quality or health they are producing. The pet store or dog broker will sell you a puppy with a breeder's name attached to the paperwork--but this puppy may easily have been born in a puppy mill. His sire and/or dam are nowhere on the premises. The reputable breeder, on the other hand, will not only be able to demonstrate the pedigree and registration papers, but will also show you either the sire or dam themselves, or pictures of the parent who may be owned elsewhere. Though the mere presence of "papers" does not guarantee good health, conformation, or temperament, you will most often find these attributes in the puppy who has been raised with loving care in the home or kennel of a conscientious hobby breeder. Your local dog show is a good source---and is one of the purposes of such shows. 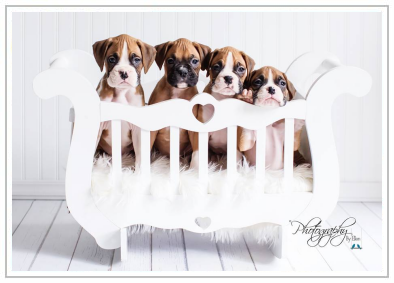 Boxer magazines publish ads from breeders. The American Boxer Club web site (www.americanboxerclub.org) can direct you to breeders across the country. Usually any time after 7-8 weeks. Many states have regulations regarding minimum age. However, your individual circumstances must be considered. Do you have the time to spend with a very young puppy? Will someone be home to housebreak him? Would an exuberant 6-month old puppy overwhelm a tiny child? Or would he be better matched with a 6-year-old youngster? Remember too that the puppy under 3 months needs lots of time to rest. Don't forget that adult dogs, already trained, also make ideal pets. This choice is a matter of personal preference. Both males and females make admirable pets. Breeding is a serious committment of time, energy, and money, and not to be taken lightly. If breeding is not anticipated, it may be appropriate to spay or neuter your dog. This procedure is best done as your Boxer approaches adolescence. Please be aware that these surgeries should be discussed with your veterinarian as to safety of anesthesia and any long term effects other than sterilization. Spayed and neutered animals are not eligible to compete in the conformation ring but may be shown in performance events. Tails should have been docked within a few days of birth. Optional removal of front dewclaws (fifth toes) is done at the same time. The Boxer has no rear dewclaws. Ear cropping is customary and appropriate but not required--it is a matter of personal preference. Uncropped ears are permitted under the breed standard. If cropped, this procedure is done under general anesthesia, usually between six and nine weeks of age. If the puppy is taken before cropping, the breeder usually makes arrangements. The breeder also advises regarding aftercare and taping if ears are not already standing. Sometimes this is a lengthy process. In the male, both testicles should be descended into the scrotum. They should be in place by two to three months of age. A dog with undescended testicles may still make a fine pet, though he would be ineligible to compete in the conformation show ring. Consult your veterinarian for advice. Avoid the unusually quiet, inactive puppy, or the one that might shy away from you. This might mean a fault in temperament or even ill health. a. A three or four generation pedigree signed by the seller. There should be no extra charge for this. The pedigree preferably gives the color of the sire and dam, and the AKC registration numbers of each. If the puppy is not to be bred, and is being purchased only as a companion pet, the breeder may check off the Limited Registration option. This does register the puppy with the AKC. However, it does not allow any registration of offspring from the mature dog. The breeder (and only the breeder) can cancel the limited registration should the puppy at maturity be considered of breeding quality. a. Date and type of vaccines given. Depending on the type of vaccination program started, your veterinarian will advise you on following through. Vaccination protocols are evolving even among the medical professionals. b. Date and agent used for worming, if done. Do not worm your puppy without consulting your veterinarian. Avoid store-bought preparations which can be dangerous. c. Diet your puppy has been receiving. It is well to maintain the regimen begun by the breeder, especially while the puppy is adjusting to his new home. If changes are to be made. do so very gradually, so as not to upset his system. When he is an adult it will be wise to maintain your Boxer on two smaller meals a day.